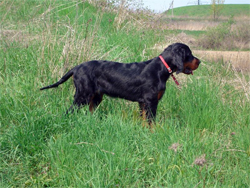 The Gordon Setter is a larger breed of hunting dog, a member of the Setter family of dogs that also includes the English Setter and the Irish Setter. 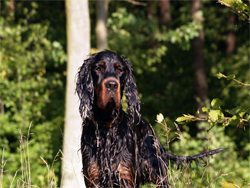 The Gordon Setter hails from Scotland, and his ancient lineage traces back to the early 17th century. Gordon Setters will hunt all game birds including waterfowl, and they are a natural retriever along with strong pointing instincts. 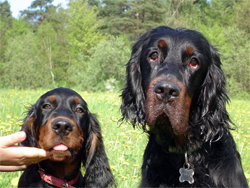 The Gordon Setter is affectionate and a loyal gun dog, blending well with the family environment. Gordon Setters, also known as "black and tans", are notable for their beauty as well as their bird sense, were imported to America in 1842. They have a coal-black coat with distinctive markings of a rich chestnut or mahogany color on their paws and lower legs, vents, throat, and muzzles; one spot above each eye; and two spots on their chest. The breed is one of the slowest to mature, not hitting prime until three years of age or more, and will show puppy-like characteristics well into their older years. Gordon Setters were bred to run, and require approximately 60 to 80 minutes of vigorous exercise daily. Young gun dogs should not be over-exercised or begin their agility training until they are at least 18 months old, to avoid joint problems later in life. Because of their hunting instincts, Gordon Setters should not be allowed to roam freely if unsupervised, as they are apt to wander into a potentially dangerous traffic situation while following a scent.